Nobody said dog coats had to be fashionable. Dogs get cold too, y'know. 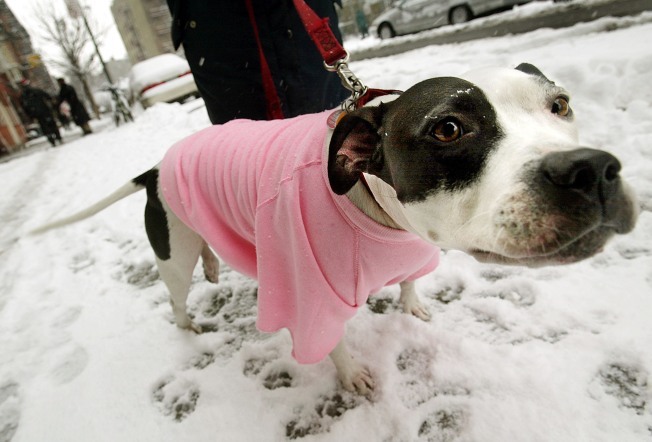 Well lucky for them, a partnership of organizations in Dyker Heights is holding a coats-for-canines drive for homeless Brooklyn dogs. It goes down this Saturday, Nov. 22 from 12-4 p.m., where they'll be hosting the Dog Coat and Blanket Drive, collecting gently used or new dog coats (all sizes) for the city's local rescue groups and shelters. This is fantastic, as you know there's nothing more adorable than a dog in a silly coat out on his morning walk. They always look somewhat ridiculous, but probably do freeze their little doggie butts off in cold weather like our last two days. Groups that will benefit from the drive include Bobbi and the Strays, Sean Casey Animal Rescue, Animal Care and Control shelters in Brooklyn and Staten Island, BARC, Tavi & Friends and North Shore Animal League; however, if you represent a rescue group or shelter that could use some extra blankets or coats, they want to help! Just visit the civic association's page at http://dykerheightscivicassociation.com and hit "Contact Us" to specify how many coats and what sizes your organization needs. It's all sponsored by the Dyker Heights Civic Association, and in cooperation with Root Hill Cafe, which is owned and operated by the "bets dogwalker in Dyker Heights." Further, the initiative is supported by the Mayor's Alliance for NYC's Animals, Animal Care & Control of NYC, Community Board 6, and "local animal advocate" Mary Jo Tobin. That right there is the ultimate dog alliance. Happy holidays, canine friends!